A charming villa set in quiet surroundings with views towards the sea and mountains. Safety gates are installed leading to the private pool area enhancing a child friendly environment. Spacious Kitchen Diner with good facilities. Farmers market 5 minutes away, fitness centre, bakery, chemist, hairdresser and local kiosks close by. 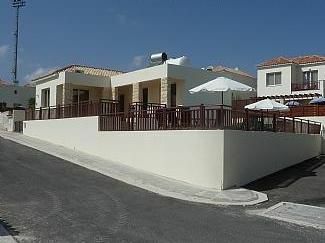 Coral Bay being only a 10 min drive away numerous restaurants and bars and a beautiful beach are in easy reach. A car would be advisable to enable a wider exploration of the many wonderful sites Cyprus has to offer by day and night. Local bars are also within walking distance with the Brewery Bar Harris Bars providing nightly entertainment throughout the year. Superfast Internet/WIFI is provided free with UK TV - CATCH UP TV - and sky sports stations included . With over 2000 movies available and the streaming of games for further viewing. KID'S TV programmes and Disney DVDS are also provided for viewing. With a new 40 INCH LCDTV viewing TV programmes, DVD and Movies is enhanced. Safe drinking water is also available via a small tap within the kitchen sink. All electricity is included within the cost of the villa although excessive use of the air conditioning facilities may incur some extra costs. We are a couple in our early 70's and have had the villa in Cyprus for10 years. It was built for us and having spent many a happy holiday on the island in various hotels we decided to buy a villa. We think of this villa as our home when away from the UK and have tried to furnish it practically for all who come to stay here. We have had many guests returning to our villa over the years and have left wonderful comments for future guests to read. En-suite shower room with WC and basin to master bedroom. Bathroom with bath/shower over with WC and basin. Notes on accommodation: No smoking in the villa. Pets not allowed. Child friendly. Safety deposit box sited within villa. Key box by front entrance. Outside: Front and rear garden patios with paved and decoratively shingled. Small barbecue. Two large umbrellas. Sun loungers with matresses (not to be used in the pool). Dining table with chairs. Pool toy box + life buoy. Private 6m x 3m pool (unheated). Own driveway. Pool can be used at all times. Utility Room: Not available. Cleaning / Towels / Linen / Maid service: Pool towels, bath and hand towels are all provided. Full linen provided. Villa fully cleaned prior to arrival and on departure. Cleaning detergents and equipment are available within the villa. Villa managed by UK representatives. Thanks for your comments we will be pleased to install grab rails so you will benefit if you should wish to return next year with us. 10 minute drive to Coral Bay beaches. 15 minute drive to superb sea caves. Paphos Airport approx. 35 mins (25km). Larnaca Airport approx 1hr 45 mins (120km). Peyia Village 20 min walk - 5 mins by car. Paphos Harbour 25 mins by car. Coral Bay 10 mins by car. Local shops 5 mins walk. Tomb of the Kings 20 mins by car. Bird and animal park outside Coral Bay 20 mins by car. Good night life Coral Bay & Paphos. Extensive variety of restaurants and bars in nearby Coral Bay. Villa set in quiet surroundings. Changeover Day: Flexibility arranged for late arrivals or departures. Notes on prices: Although air-conditioning is inclusive within the villa rental excessive usage will result in charges being deducted from the security deposit. £200.00 GBP refundable (subject to any damage/breakages) to be paid at time of full balance and on a satisfactory inventory fully returned within 7 days of departure. 100% payable at time of booking Payment by cheque, BACS, BANK TRANSFER or Euros accepted.